What are the white moths that fly up from my grass, and how do I get rid of them? 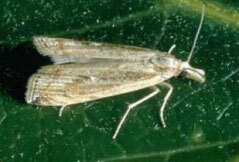 Sod Webworms are one of the most widely recognized groups of turf grass pest insects. The adult moth form is commonly observed darting across the lawn when their environment is disturbed. The adults don’t cause damage, the larvae do! To help control the egg and larvae form of Sod Webworm moths, we offer an insecticide application in summer. This treatment is applied based on when the moths lay their eggs. Please call L.C.S. Lawn and Tree Service, Inc. today to schedule your treatment. Keeping your lawn well watered and fertilizer will minimize the damage. Watering; adequate water in the summer months will help to reduce damage areas and help aide in recovery. Mowing; be sure to mow the lawn at the appropriate height. Mowing higher in summer months will help the lawn to retain moisture and reduce damage. Insecticide; Spray lawn with a liquid insecticide using a hose end sprayer. This will not eradicate the adult moths because they are airborne. You want to control the eggs the moths lay, and the larvae that feed on the grass.